There aren’t too many overachievers in our lifetimes like John Denver. To read over his accomplishments just outside of his legendary musical career are as equally astonishing and captivating. Cedar Rapids, Iowa was always a special place for this performer and on December 10, 1987, John Denver treated this lucky audience to almost three hours of non-stop hits, storytelling and his utmost musicianship unlike most performers of their time. 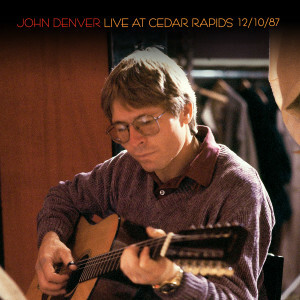 This marathon performance was captured on tape and thanks to the good folks at RCA Records, Relayer Friday Music is now very proud to offer the newly remastered 2 CD deluxe set John Denver — Live At Cedar Rapids 12/10/87. For most of this wonderful limited edition set, all you get is John Denver, his voice, his guitar, and his stories captured in song. A highly personal set of music beginning with classic Love Is The Master from his One World album, and immediately paying a nod to The Beatles with his brilliant rendition of Mother Nature’s Son. From this point on, he just sets the audience up for even more incredible performances like his classics Take Me Home, Country Roads and Back Home Again, plus more progressive fare from his AOR radio era where even the more daring early seventies rock programmers would indulge into album sides of songs from Farewell Andromeda and Rhymes And Reasons. The second disc enclosed continues with some newer material like his later adult contemporary hit Shanghai Breezes, and then of course, the bulk of his smash number ones and most loved tunes like Annie’s Song, I’m Sorry, My Sweet Lady, Rocky Mountain High and Calypso completing the concert and making this one of the most rewarding shows you will ever hear from this legend artist and humanitarian.